June is generally sunny, with temperatures in ranging between 17 -27 degree Celsius and sea temperature ranging between 22-24 degrees Celsius. You should be able to swim in the sea and make sure you bring sun protection cream as the sun can be strong. Please make sure that you have comprehensive travel insurance before you start the trip. This insurance could include cancellation of flights, medical expenses including repatriation, loss or damage of baggage etc. Italy is a European Union member and Schengen Area member. All citizens of Schengen area countries can travel without a visa. To check whether you need a visa you can check here. Bari has an international airport also known as the Karol Wojtyla Airport. Located around 11 km from the city centre, the airport can be easily reached by train or by bus. Bari airport serves 50 different destinations all over Europe. The airport is only 10 kilometres away from the conference venue Hotel Riva del Sole. Being Italy member of the EU you can use your European phone subscription without roaming charges. Local currency is Euro. From local ATMs you can draw cash. It is suggested to have a certain amount of cash with you, as not all the shops have card payment. It is usually possible to pay by card with Visa, Master Card or Maestro. Some shops could surcharge you if you want an amount smaller of 5 euros by card. More information on the cost of living in Bari can be found at Numbeo. Bari offers many creative dishes with colourful vegetables such as orecchiette con le cime di rapa (orecchiette pasta with turnip tops), patate riso e cozze or red-yellow peppers stuffed with meat or rice and baked in the oven are another speciality. The cuisine also includes seafood, such as, bass, clams, cuttlefish, mussels, oysters, cod, prawns, sea bream, lobster, anchovies and sole, which are cooked in a variety of methods. There are pizzerias for every type of pizza and bakeries for focaccia, taralli and the famous Altamura bread seasoned with the area’s extra virgin olive oil. 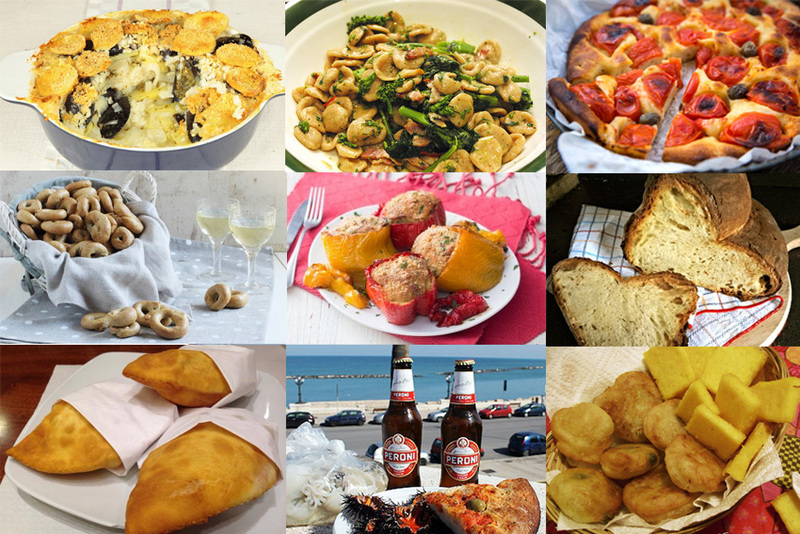 Typical food from bari (from top left): Patate riso e cozze, Orecchiette alle cime di rapa, Focaccia Barese, Taralli e vino, Peperoni ripieni, Pane di Altamura, Panzerotti fritti, aperitivo Ricci di mare-Focaccia-Allievi-Peroni, Popizze & Sgagliozze. Bari has one of the most vibrant nightlife in the south of Italy, the term to describe such nightlife culture is “movida”. The people from Bari love to be outside during the night considering the favourable weather and walk around the old-town in Piazza del Ferrarese, Piazza Mercantile, Lungomare di Bari, Corso Vittorio Emanuele, Molo San Nicola. People are generally very friendly and helpful in Bari, they will try to give you all the assistance you need if you ask, but make sure you respect them. Bari has become a famous touristic destination so people are ready to speak English with you. For precaution, watch out your belonging like smartphones, wallets or cameras since episodes of thievery are somewhat frequent especially in the old town. Do not photograph local people without asking first for their permission, or better be in the picture with them. Tipping in Bari is at your own discretion. You will not be chased if you don’t tip, but it is normal to leave around 10% as a sign of appreciation for good service in bars and restaurants, less so with taxis, and subject to your own preference with tour guides. Italian is a Romance language. Italian is by most measures the closest language to Vulgar Latin of the Romance languages. Quanto costa? = How much is does it cost?